Slack may be the darling of the group communication market right now, but there's one thing it's missing: voice and video calling. 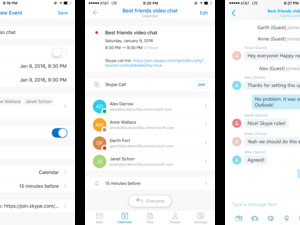 Microsoft is aiming to patch that up with a new integration between Skype and the popular messaging service. The imaginatively-named Skype integration for Slack creates a new command that lets people type "/skype" into a channel or private chat and have Microsoft's conferencing service automatically generate a link that will launch a call for participants in the conversation. Everyone in the channel will get a notification letting them know that there's a call going on. Links generated with the integration can be launched with the Skype mobile and desktop apps, or opened on the desktop web with or without a Skype account. It's currently available in beta for any team that has an open integration slot in their Slack instance. What's interesting about this move is that Microsoft already has a workplace communication product designed to get teams working together called Skype for Business (previously known as Lync). But Slack is a rising star in the workplace collaboration market, so it makes sense for Microsoft to try and link its products to a market leader in order to maintain their relevance. It will be interesting to see what happens to the integration in the future. Last year, Slack acquired Screenhero to help the company build out future voice and video chat features for its product, though they haven't materialized yet. The launch comes during a big week for Skype overall. On Monday, Microsoft announced free video conferencing for users of all of its mobile apps, to go along with the same capability on desktop. On Wednesday, an update to Outlook allowed users to create video conference links inside calendar events with a tap, and this integration adds another way for people to easily summon Skype.